The Sons of the American Legion, Glen Hill Squadron 287, of Cedar Springs would like to congratulate Burdette Helenius of Cedar Springs. Burdette’s winning ticket for the Rifle Raffle was drawn on November 12. 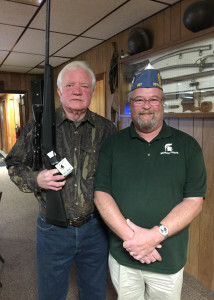 Pictured is Burdette holding his new Remington 7mm Mag and Squadron 287 Commander Dominic Merlington.